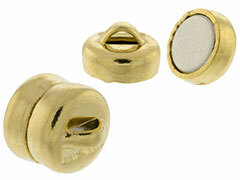 Magnetic clasps are wonderful closures for bracelets and light to medium weight necklaces. Popular with people who have difficulty with toggle or lobster clasps, magnetic clasps can be easily attached to jewelry with jump rings or crimps. INM Crystal offers several different sizes and styles of magnetic clasps in silver, copper and gold-plated finishes as well as sterling silver and gold-filled. Please note that magnetic clasps should not be worn by persons using pacemakers. For examples of jewelry using magnetic clasps, please visit INM Crystal’s Idea Gallery.